Night was falling and the warrior could see city lights ahead across the wheat fields. He was walking slowly, recalling an uncanny blind old man he had met that day who kept prophesying the imminent end of the world. The warrior was laughing to himself about the encounter when the earth violently shook. He tumbled to his knees and waited. When the ground’s trembling eventually ceased, he carefully stood and looked around. Moments ago, the warrior had been surrounded by miles of tall green wheat. Now, he stood in a parched, lifeless wasteland. 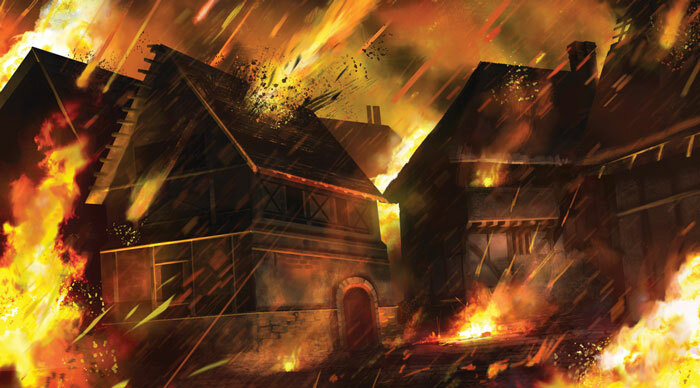 Doom approaches in The Harbinger, an upcoming expansion for Talisman 4th Edition. 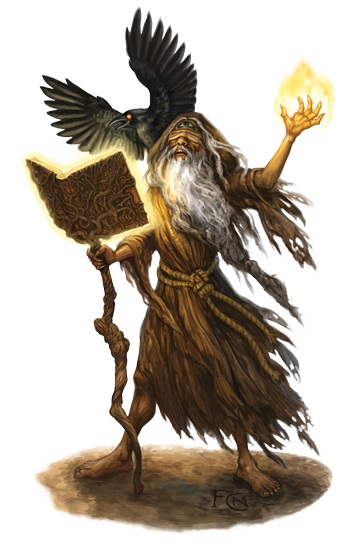 As dire omens fill the skies, demons roam the countryside, and plagues ravage civilization, the Harbinger wanders throughout the realm of Talisman, prophesying the imminent end of the world. If you encounter him, he may help you stave off the end of the world and let you peer into the future, or you may be attacked by demon horsemen and stalked by cursed followers. Time is running out. When the Harbinger entered the realm he brought with him a prophecy of impending doom and a series of seven Omens to watch for: when the seventh appears, the end is upon you. 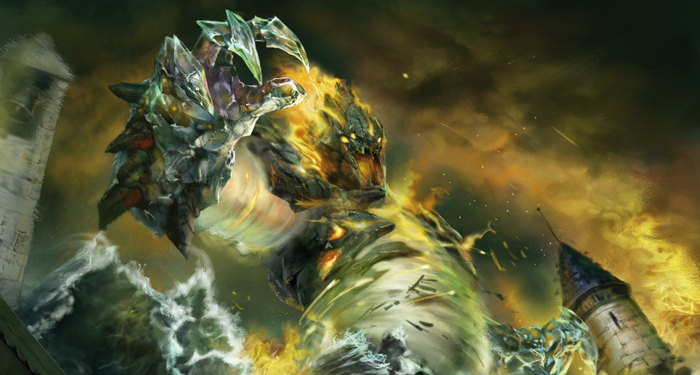 The Harbinger features four unique decks of Omen cards, each making manifest a different downfall. In one Omen deck the constellations align, threatening the extinction of magic. In another, the dead rise from their graves and battle to overthrow the living. In another, the time of judgement arrives bringing with it war, famine, death, plagues, and other forms of destruction. No one knows whether the mysterious Harbinger is the cause of the apocalypse or merely a prophet announcing its approach. What is clear is that wherever this aged, blind, ragged man goes, misfortunes follow. He is best avoided, but with doom at hand, it is inevitable that you will encounter him during your quest for the Crown of Command. 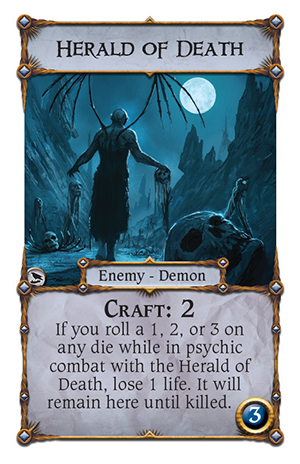 When the Harbinger is in your region – even if you’re in the Dungeon, the Deep Realms or the Woodland– you must draw from the peril-filled Harbinger deck instead of that region’s normal Adventure deck whenever you are instructed to draw cards. When you draw an Event, the Harbinger moves into your space, but has no ill effects upon you. However, you move into the space occupied by the Harbinger, you must roll a single die. The result could grant you a second turn, or let you look at the top three cards of any deck you choose. It might force you to populate your space with vicious enemies, treacherous followers, and unpredictable events. Worst of all, your result might cause the current Omen to be discarded, activating the next Omen and hastening the advent of the end times. The Harbinger deck is full of apocalyptic horrors never before encountered. 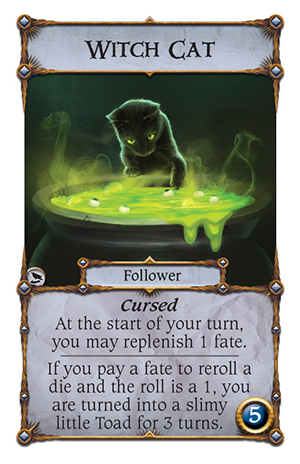 It introduces a cruel new keyword, Cursed, which compels you to take up undesirable objects such as the devious, black Witch Cat or the lethal Flail of Blood . 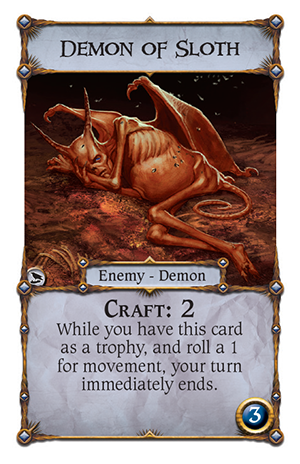 It also unleashes a new type of Enemy: demons, like the Herald of Death and Demon of Sloth , who have spent aeons waiting patiently for the beginning of the end times. These monsters are now emerging from the dark Abyss to gleefully wreak havoc upon all life in the realm. As civilization begins to collapse around them, three new characters bravely embark upon the journey toward the Crown of Command. One is wholly sacred and good with Craft limited only by the amount of fate he possesses. Another is purely and unchangeably evil, his strength entirely dependent on his life. 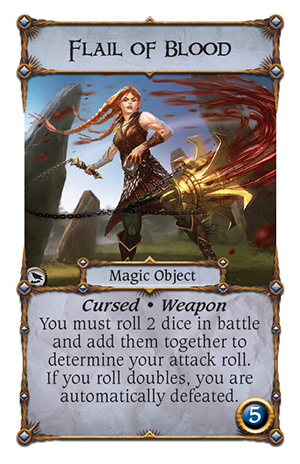 A third new character begins the game with four Spells, divine gifts that do not count against her Spell limit and that can be replenished over the course of the game. Two alternative endings are also included. 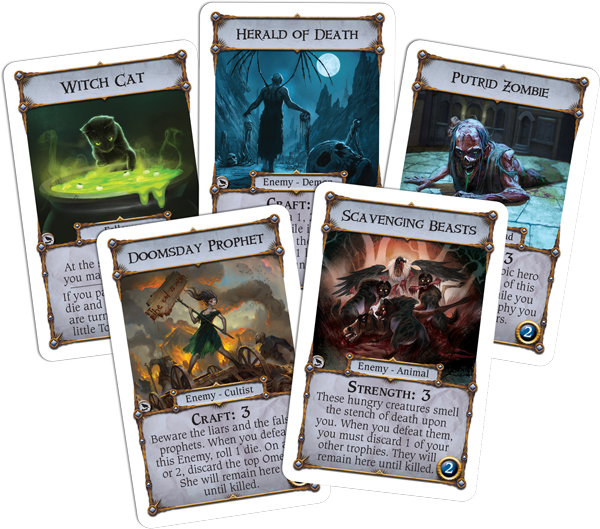 End of Days challenges players to defeat the four Horsemen of the Apocalypse as they haunt the realm. Once they are defeated, you may continue to the Valley of Fire, where must fight the most powerful demon of them all. Armageddon Crown turns the Crown of Command itself into a potentially deadly object. A character on the Crown of the Command rolls a die in his turn, in the hope of ending the world and triumphing in others’ doom. All other characters must draw Harbinger cards and fight for survival as they strive to reach the Crown themselves. 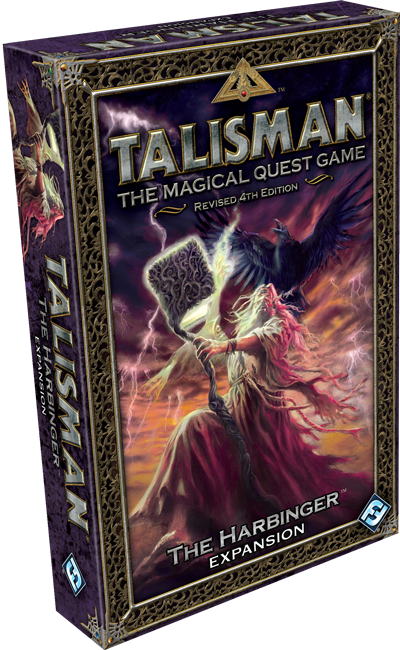 In your travels throughout the realm of Talisman you have defeated incredible enemies, and equipped yourself with powerful spells and priceless objects. Yet nothing you’ve encountered can prepare you for a time when dark portents fill the skies, demons fill the countryside, and the very ground transforms beneath your feet. Prepare to undertake a perilous quest during the opening stages of ultimate doom. Only the most formidable can reach the Crown of Command before the end of the world. 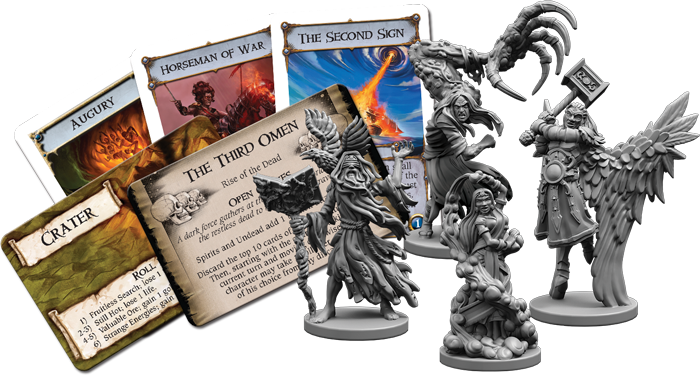 The Harbinger is coming to Talisman in the second quarter of this year. Pre-order it today!